Bedford Tavern are committed to raising funds for all LGBT/HIV organisations in the city. 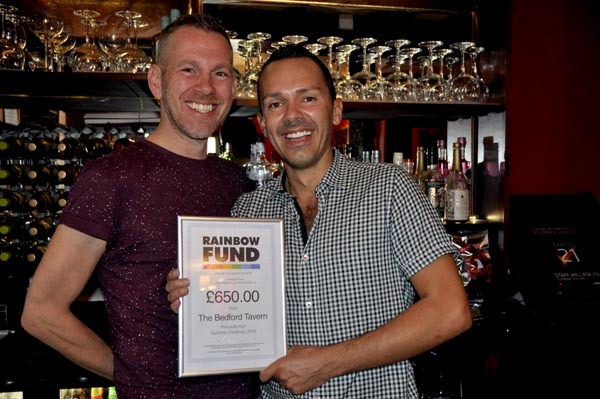 GOLDEN Handbag Favourite Barman Matt Richards and Adam Brooks, the multiple winner of the Golden Handbag Favourite Landlord award, receive certificate for raising £650 for Rainbow Fund during their Christmas Summer Xmas Weekend in June fundraiser at the Bedford Tavern. Events during the weekend included Kristmas-Oke on Friday (22), Spice’s Christmas Show on Saturday (23) and a three course Christmas Lunch on Sunday (24). Through an independent grants panel, The Rainbow Fund give grants to LGBT/HIV organisations in Brighton & Hove who deliver effective front line services to LGBT+ people in the city. In the 2017-18 grants round the following organisations benefitted from grants amounting to £110.688: These included Allsorts Youth Project (£5,000), Brighton Gems (£1,725), The Clare Project (£5,000), The Rainbow Chorus (£7,150), Older & Out (£5,270), Sussex Beacon (£7,500), Accessibility Matters(£1,800), Whitehawk LGBT support group (£1,000), Trans Alliance (£5,000), Peer Action (£7,300), Lunch Positive (£8, 082), MindOut (£14,989), Switchboard (£11,725), and LGBT Community Safety Forum (£29,147). Successful groups/organisations receiving money in the 2018-19 grants round will be announced at The Rainbow Fund LGBT+ community grants presentation evening at The Hilton Brighton Metropole on Monday, October 15, at 7pm which will be hosted by comedian Zoe Lyons and Lola Lasagne.